This months Warhammer: Visons devotes a whopping eight pages to Inqusitors Carax and Kushing and their cohorts. I'd like to take this oppurtunity to thank John for featuring me yet again and to the WD team for taking such lovely pictures of my models! Congrats, that's very cool! Well deserved. And is that a Slannesshii Marine there at the top? Thanks excellent, Johan! Congratulations (again)! Not sure if they have changed the format but it's such a shame that when it was in white dwarf they seemed so restricted in what they could say about the models as if accepting Necormunda existed was some kind of sin. If there was more text to go with the lovely pictures I'd probably get Visions. Look like it will end by being called Vadertsu... Congrats mate! Big congrats - nothing less than well deserved. I look forward to it! Very much deserved. Congrats mate. That said the word count in in Blanchitsu, even back in WD, was always kept to a minimum. But yeah - a short interview would have been nice. A chance to explain the models. But I think Johns philosophy is that the models should speak for themselves. And there's a lot to be said for that philosophy, certainly! But then again, there's also the fact that people who create beautiful and evocative models usually also have something interesting to say about theit take on the 40k universe -- so I would be in favour of interviews, no matter how short, as well! 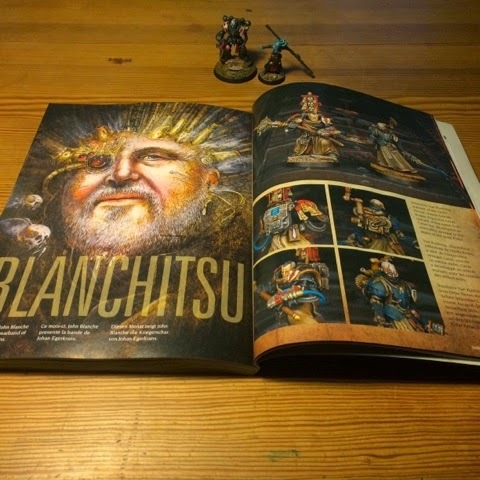 On a related note, my copy of Visions arrived yesterday, and I can now safely say that your Blanchitsu spread is the absolute highlight in an otherwise fairly unremarkable issue! I´d buy that for a dollar! Spectacular spread Johann as others have said well deserved - i think you are one of the most prolific and talented artists working in 40k at present ! Congratulations! Another well deserved spotlight on your work. I will have to buy the issue! Congrats on the nomination, they're beautiful to behold. One down - two to go.